But what about the rest of the “Diff’rent Strokes” cast? Here’s a quick rundown: Conrad Bain is now 87 and retired; one of his final acting gigs was reprising the role of Mr. Drummond on a 1996 episode of “Fresh Prince of Bel-Air.” Charlotte Rae found even bigger fame when she moved over to “The Facts of Life,” of course. She’s still acting, and guest-starred in a recurring role on “ER.” After Mrs. Garrett moved to Eastland, housekeeper Adelaide took over; spunky actress Nedra Volz passed away in 2003. Pearl, played by Mary Jo Catlett, took care of the Drummond kids next; Catlett went on to entertain a whole new generation of TV viewers as the voice of Mrs. Poppy Puff on “SpongeBob,” and showed up in a brief role on “Glee” just a few weeks ago. 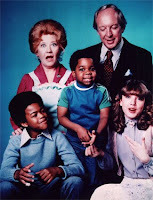 Tomorrow: Some more "Diff'rent Strokes" cast, including Dudley!